This time-lapse image demonstrates the spread of a nerve fiber through the skin of a zebrafish tail fin. 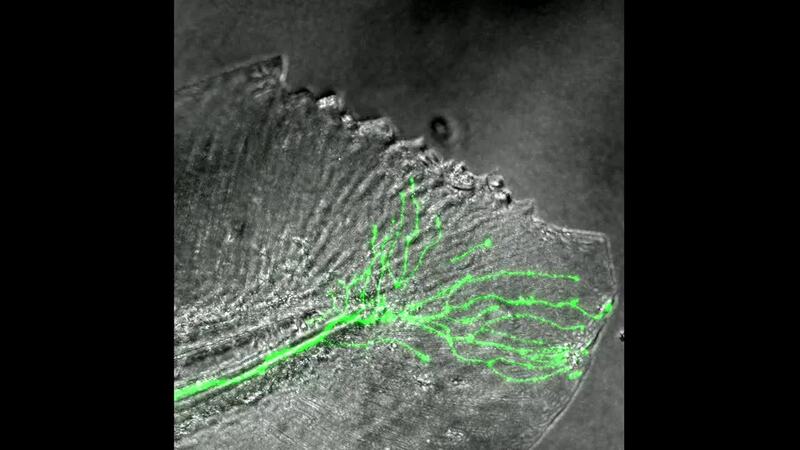 Using time-lapse photography over a period of 12 hours, Sandra Rieger (MDI Biological Laboratory, Bar Harbor, Maine, USA) utilized a fluorescent marker (green) to track a nerve fiber spreading through the skin of a zebrafish tail fin (gray). The nerve regeneration occurred in spontaneously forming tissue that was replacing a section of a young zebrafish’s tail fin that had been removed 3 days earlier. Read our interview or listen to our podcast with Rieger to discover more about her research.